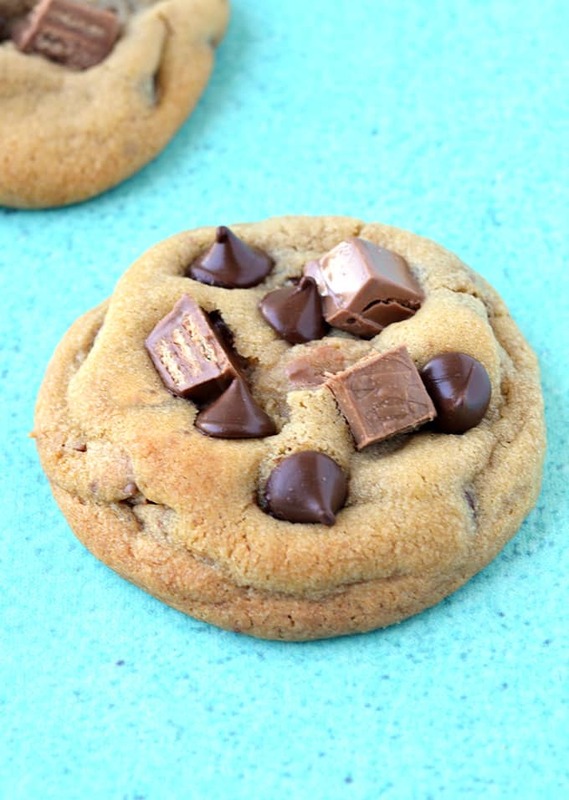 Soft and chewy Kit Kat Chocolate Chip Cookies filled to the brim with Kit Kat candy. These buttery cookies are made with melted butter so they come together using just a bowl and a spoon. Big. Buttery. And loaded with chocolate. You’re going to love this one bowl cookie recipe – no mixer required. I’m addicted to making cookies with melted butter. Have you tried it before? 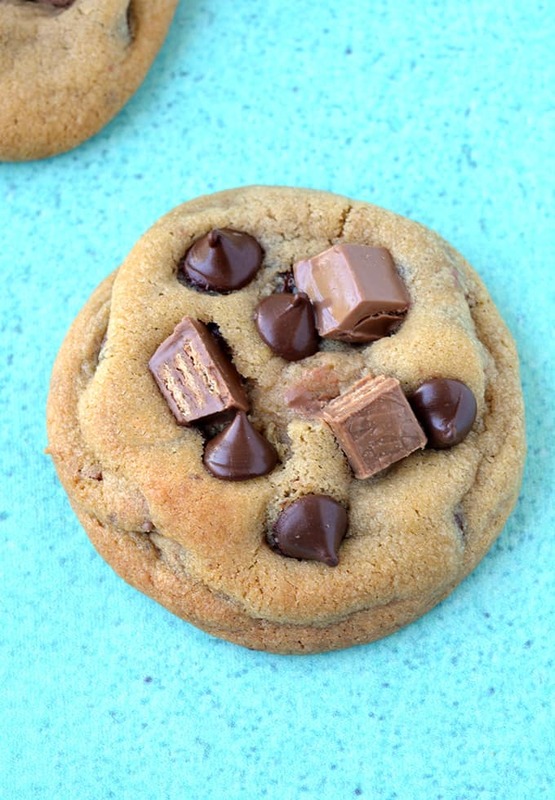 Just like my Rolo Cookies, these Kit Kat Cookies are soft and chewy and they come together in minutes. Seriously. The only catch is you do need to chill the dough. This will ensure it has time to firm up, so the cookies don’t spread too much when baking, and the flavours can merge together. You only need to chill them for one hour and it is most definitely worth it – trust me. 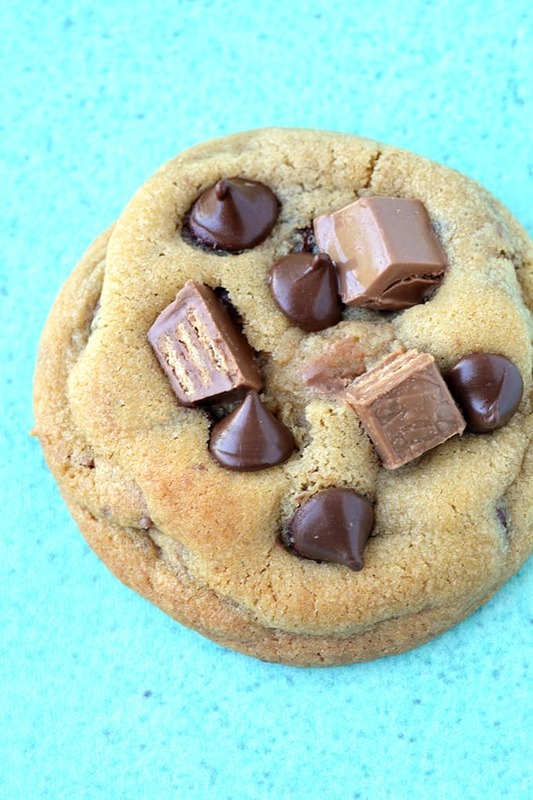 If you’ve never had a Kit Kat in a cookie before, you are seriously missing out. These wafer chocolates are delicious wrapped in cookie dough, especially warm from the oven. These Kit Kat Cookies are made with *almost* melted butter. Use the microwave to melt the butter but don’t heat it until it’s hot and bubbly, just until it’s almost melted and use a fork to gently stir it until smooth. Using melted butter means these cookies have to be chilled before baking. If you don’t chill the dough, you run the risk of the cookies spreading too much when baked. 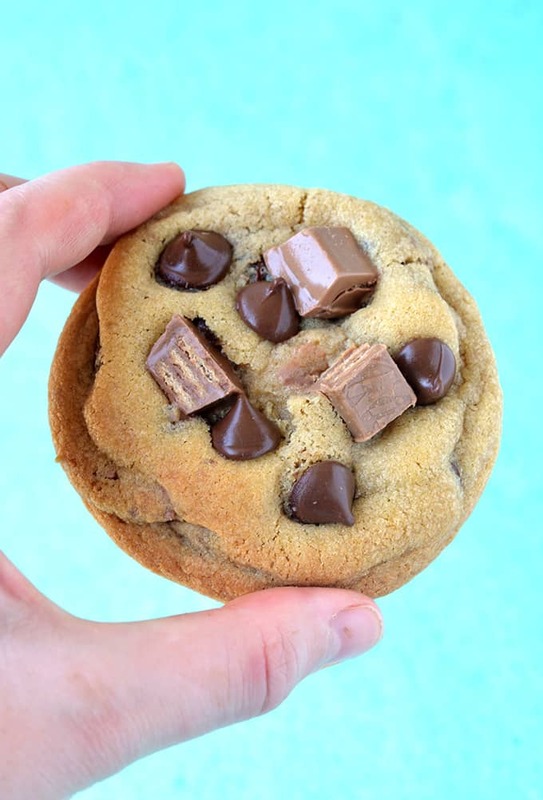 To make your cookies look like mine, make sure you set aside a few chocolate chips and Kit Kat pieces to place on top of the cookies while they are still warm. 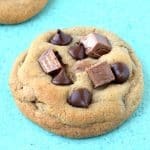 If you like your cookies thin and crispy, you can add 1/4 cup less flour but I love these cookies just the way they are! They have crispy golden edges and soft centres oozing with chocolate. These buttery Kit Kat Cookies are packed with chocolate chips and Kit Kats. Add sugars, vanilla and egg and stir until smooth. Add flour and baking soda and stir until soft cookie dough forms. Add Kit Kats and chocolate chips and stir until combined. Roll large balls (roughly 1.5 tablespoons) of cookie dough using your hands and place on oven tray. Bake for 10-11 minutes or until golden on the edges. 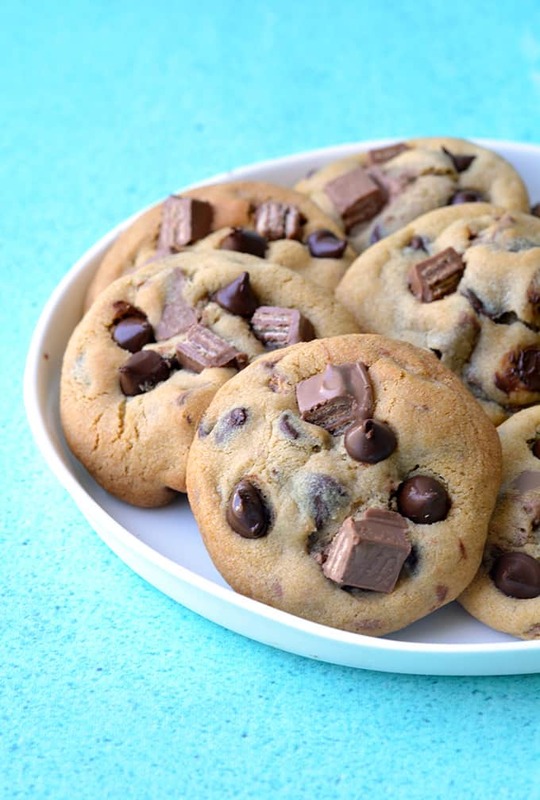 While the cookies are still warm, add a few extra chopped Kit Kats and chocolate chips on top. Carefully transfer cookies to a wire rack to cool completely. This recipe was first published on Sweetest Menu in January 2017. These cookies look so delicious! I love Kit Kat! 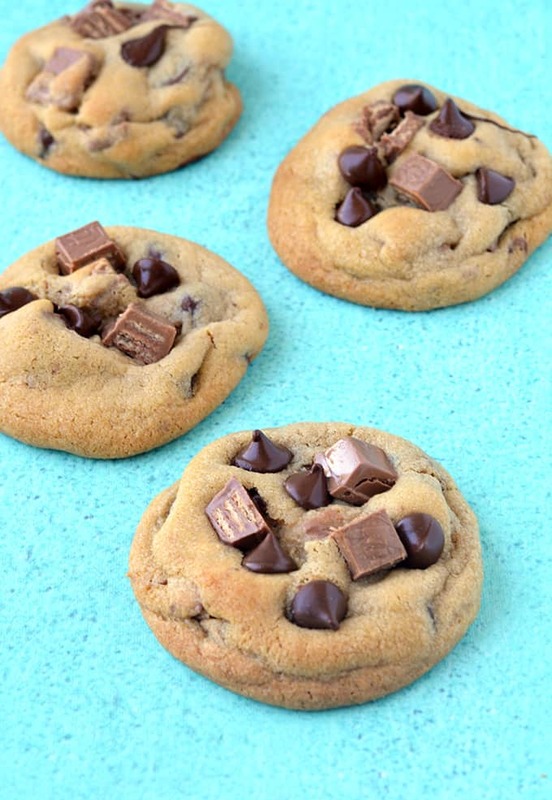 Love Kit Kat chocolate bars and so do my kids, will have to try these cookies soon! I hope you get to try them Fida! We all LOVE Kit Kats here! I have never thought of putting them in cookies before. Luckily you did! I bet my girls would go NUTS for these! Thanks Melissa, sounds like they would LOVE them!